The Wild Ride Called Self-Publishing: Cathy Richard Dodson talks about her experiences with self-publishing: Cathy Richard Dodson, author of Shadowed Memories, discuses not only the inspiration for her book, but also the process involved in bringing it to publication. She talks about many of the pitfalls that the self-publisher faces along with the benefits. 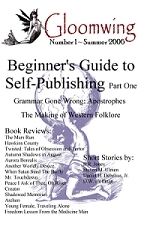 Beginner's Guide to Self-Publishing - Part One: In this first installment, David Hoffman discusses, in great detail, just how to use MS Word to format a book. Topics covered include: Setting up the page, formatting the text, inserting sections, inserting page numbers, inserting headers (Book's title & Author's name), embedding true-type fonts, front-matter, and more! Bunkhouse Notes: The Making of Western Folklore (Column): Steven M. Ulmen talks about his favorite topic, western folklore. The Everlasting Possibilities of The Ever So Briefly by Daniel H. Debelius, Jr.